Poco a poco. Little by little. I learned how to re-light my water-heater. Push knob to summer setting and hold in while pressing the ignition underneath until it lights. Release both knobs slowly. Hot water again – hurrah! 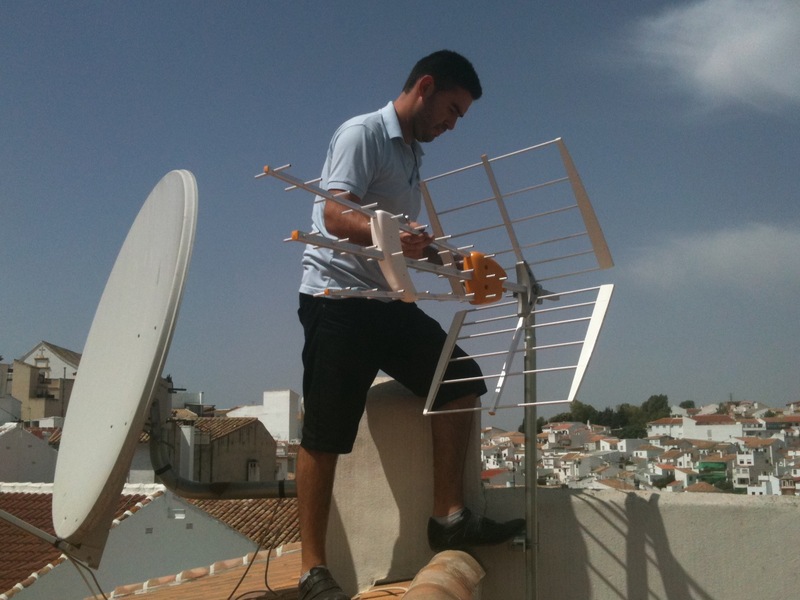 Jose from the local TV shop has been back to put up my aerial, which now serves a dual function. Primarily it provides me with Spanish TV programmes to help improve my language. Additionally it provides me with a tall post on the top terrace, to which could be attached a line and some screening should I find that the single high balcony that could overlook me is occasionally used by its owners. A first evening curled on the sofa watching TV – it’s a big step towards feeling at home. The other Jose, the carpenter, came to see exactly where I want the bookshelf so he can build it to fit perfectly. He was chuffed to see the rocking chair he’d made, which I had already bought for my bedroom. Rafael has made the air-conditioning work, by installing the outside part that the previous owner of my house hadn’t got round to. And there’s a little plastic tube running un-noticed back through the wall, down a couple of stairs and outside to remove the water the machine produces. So now I can click on the air-con to cool the room half an hour before bedtime when the nights are muggy. Bliss. Antonio had arranged for me to test-drive two cars, but I’ve been thinking that it makes sense to spend a little more and get something a bit newer and hopefully more reliable. I think Sebastian at the Peugot garage might be the best contact. No need to rush – better to get it right. And most surprising of all, Telefonica (now called Movistar but still in a Telefonica van and a Telefonica t-shirt) turned up EXACTLY when they’d said (un milagro – I hope you were sitting down for that bit!) and connected my phone line. My internet company, Europa Network, is now sending me the router I need to rejoin cyber-space and regain the connectivity that feels so necessary these days. And for light relief in between all this excitement, I’ve been out and about taking photos to illustrate past (and future) installments of this blog. It is my intention that each post should have a photo, even if it’s just a snap of Jose on the roof putting up an aerial. Previous blog posts are now all illustrated – even the one about the bank collapsing! Well done about the photos. Makes them look much more visually interesting. I´m sure that Sebastian at the Peugot garage will be able to point you in the right direction. What a lovely guy! Ah excellent – you know him too? He’s been recommended by three different people!